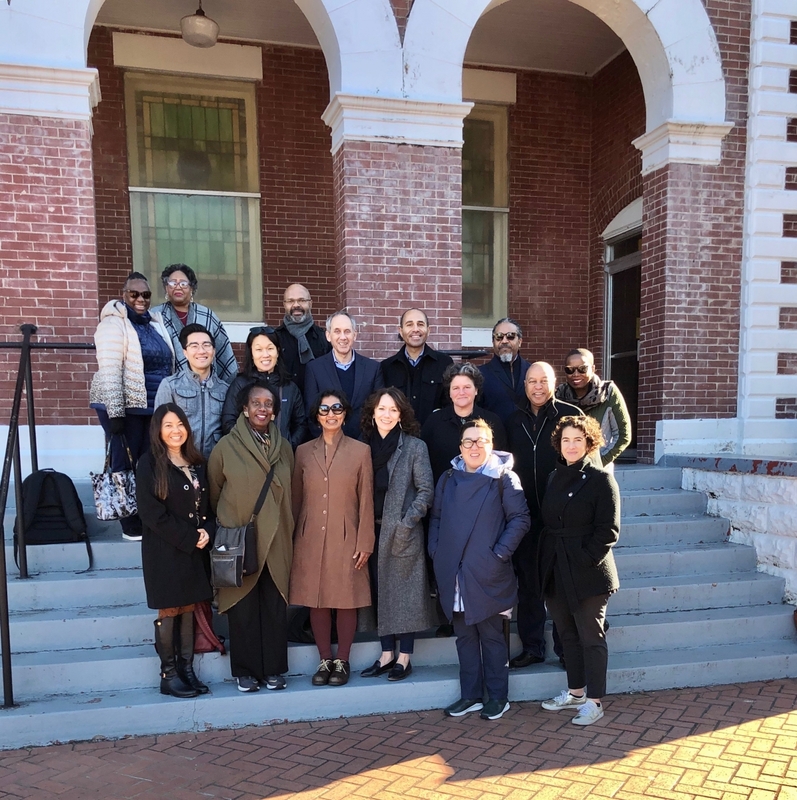 Early in January, 15 members of the Northern California Grantmakers Board and staff had the extraordinary good fortune to travel to Montgomery, Alabama together. This region is widely considered to be the birthplace of the civil rights movement, but was also the center of power for the Confederacy, the heart of the Jim Crow South, and at one time a thriving regional marketplace for the trafficking and sale of hundreds of thousands of human souls. There are vivid reminders and markers – living and commemorative – of all of it everywhere. We were blessed to share a deeply moving, 3-day journey in which we viewed, felt, and considered this complicated tapestry of our history together. We walked across the Edmund Pettus Bridge, the site of Bloody Sunday in March of 1965. We traveled Highway 80 along the route the marchers took from Selma to Montgomery to demand voting rights on a stretch once considered to be the most dangerous highway in America for African Americans. We visited the National Memorial for Peace and Justice and Legacy Museum, a remarkable memorial to 4,400 documented victims of lynching that was conceived and created with breathtaking vision and beauty by the Equal Justice Initiative. We were able to spend an hour with EJI founder Bryan Stevenson, whom many consider to be one of the most important civil rights leaders of our time. We spoke with local philanthropists about the challenges they face in their work, what they aspire to, and how our respective efforts are inextricably linked. We visited the churches and private homes that harbored and protected the “foot soldiers” and leaders of the civil rights movement as they planned their efforts. We walked along formerly segregated streets, taking note of the beautiful fountain that now sits in the spot where enslaved black people were once auctioned by the thousands and the still-there bell that once called townspeople to the square when new boats containing human cargo arrived. We marveled at the beauty, pride, and grace of the magnificent local African-American leaders who hosted us, shared stories of the times, and brought us to these places that changed history. We laughed and we cried. We sang. And we ate (and ate, and ate, and ate)! It's difficult to do justice to it all here, or to put into words what has stayed with me and how I have been changed by the experience. A few words I will be contemplating for a while include Shame—invoked by Stevenson as a corrective—and Grace, and Resolve, and Patience, and (nearly incomprehensible) Fortitude. And that's just for starters. The distinction between past and present is an artifice. So much of what was set in motion then remains a profound challenge to us today. While the look and feel of racial oppression and white supremacy has indeed changed, the essence of the hate and greed that fueled what happened then is still in our midst. We have a long way to go, even as we have come so very far. But the people we met reminded us that, if we stick to it and stick together, seemingly immobile arcs can indeed be bent. I am deeply grateful that the NCG team was able to share this experience. We are stronger for it, and ever-more resolved to engage deeply together and with all of you to dismantle the persistent and pernicious racial equity challenges that we face right here at home that are part of the legacy of what we witnessed – and of our own making.